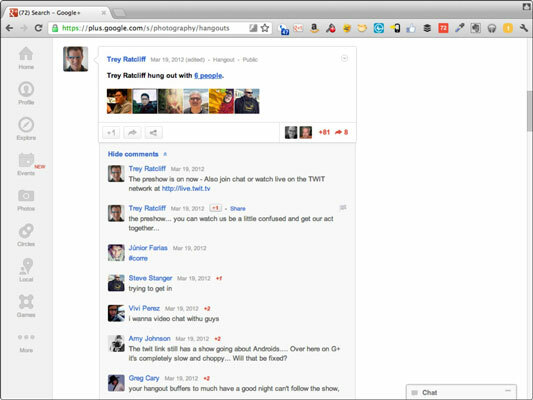 Google+ Hangouts can be an effective marketing tool to give information to your customers. If you’re looking to help others learn what you want them to know about your brand or company, one effective way to educate customers is to fill up those ten slots of video chat in a Hangout with a panel of experts who can discuss your brand in all its glory, nuance, and indispensability. One way to build an effective online marketing strategy is to identify what real-life situations could be simplified or localized using the technology available. With this particular approach in Google+ Hangouts, look to conferences and meetups where a panel of individuals speaks about a specified topic. A moderator sets the tone for the conversation, and each member of the panel is given the opportunity to share his or her thoughts and discuss the topics at hand. Imagine the benefit if all those thoughts, discussions, and topics were about your brand. The basics: Set up a Google+ Hangout, bring in ten people who know their stuff (especially about your brand), and assign one of them to be a moderator. This person keeps control of the Hangout and plays producer for your broadcast. Turn on Hangouts On Air so the conversation is broadcast, and share it to your audience. Then discuss up a storm. Allow the audience to ask questions of panel members as you share your Hangout. When you share your Hangout on Google+, your fans will be able to comment on the post and participate in the conversation. Don’t neglect this potential gold mine of customer interest. Use these comment areas as places to engage fans during the Hangout; get them asking questions. Bring in people of influence related to your brand. The more interesting the people, the more people will pay attention. If your CEO is well known, bring him or her into the panel. Another approach is to even bring in competing brands and start a conversation just around the topics your brand is most interested in. This panel could be a great way to have a constructive conversation or even debate around a particular topic. Perhaps you’ve set some ground rules ahead of time, or you have a moderator to keep the peace. Schedule your panel Hangout ahead of time. Your fans will add your Hangout to their schedules if you just let them know ahead of time that it’s happening. Panelists are especially important; the more interesting the panelists, the more people you get watching the Hangout when it goes live. Try not to share Hangouts impromptu — let your audience know ahead of time, and you’ll have a much better turnout. Consider leaving a few open slots in the Hangout so fans can participate with the panel. There’s nothing more personal and authentic than having real customers sharing their enthusiasm for the brand or participating in the conversation. Let your fans fill a couple of slots in the panelists and maybe even rotate in and out with new fans. This personalizes your panel and makes it look like you’re paying attention to your fans and customers as the panel is occurring.